My son did a presentation on Cat Care for his 4H project at school, so I thought it would be funny to send in a kitty litter cake to go with the theme. It didn’t count towards his grade, but his class got a big kick out of it. I asked him if anyone was grossed out and he said “no, mom, they loved it!” He, initially, wasn’t a fan of bringing in the cake. When I told him I was baking a kitty litter cake, he said “Gross! No one’s going to eat that! !” However, when I told him what was in it (all of his favorite sweet treats), he was completely on board. I found the “litter box” at the dollar store. It wasn’t an actual litter pan, but it looked convincing enough. This is a great cake to make for Halloween, or anytime you want a good joke or conversation piece. Doesn’t it look soooooo appetizing????? Crumble sandwich cookies in small batches in a food processor, scraping often. When cakes are cooled to room temperature, crumble them into a large bowl. Toss with 1/2 of the remaining cookie crumbs, and the chilled pudding. You probably won’t need all of the pudding, you want the cake to be just moist, not soggy. 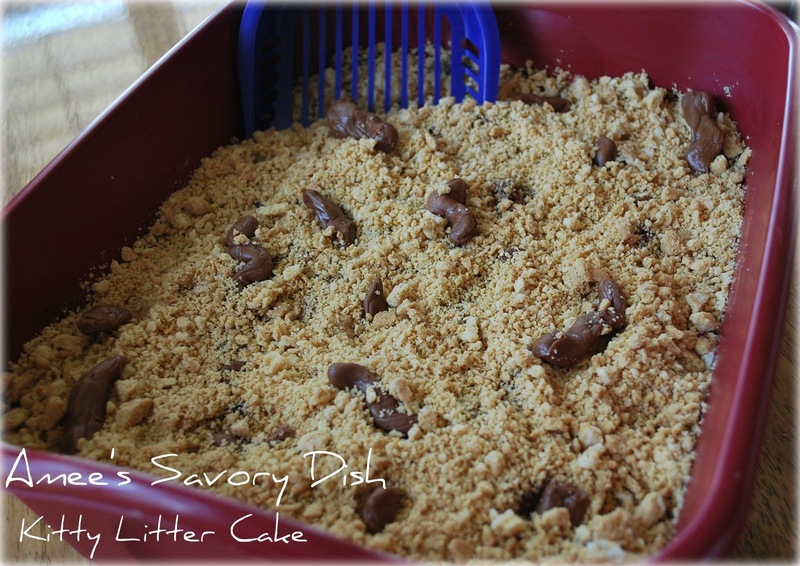 Put cake mixture into a clean, washed (never used, please) litter box. Put half of the unwrapped tootsie rolls in a microwave safe dish and heat until softened. Shape the ends so that they are no longer blunt, and curve the tootsie rolls slightly. Bury tootsie rolls randomly in the cake and sprinkle with half of the remaining cookie crumbs. Heat the remaining tootsie rolls until pliable and shape as before. Spread all but one randomly over top of cake mixture. Sprinkle with any remaining cookie crumbs. Hang the remaining tootsie roll over side of litter box and sprinkle with a few cookie crumbs. Serve with the pooper scooper. This fun party cake looks just like a cat litter box. It is served in a new, clean litter box with a new, clean litter scoop. When cakes are cooled to room temperature, crumble them into a large bowl. Toss with 1/2 of the remaining cookie crumbs and the chilled pudding. You probably won’t need all of the pudding, you want the cake to be just moist, not soggy. Oh Woman! What a perfect touch for your son’s class. I’ve seen these and just don’t think I could eat it, but it sure is hilarious and definitely a conversation piece!!! That is too funny! I might make one for my husband…. he hates cleaning the litter box. It’s an on going battle! So I’ll feed it to him….